"Although not technically in the Gold Coast, many potential buyers looking in the Gold Coast will also consider this building (and The Pinnacle) in the Cathedral District just off Michigan Avenue." 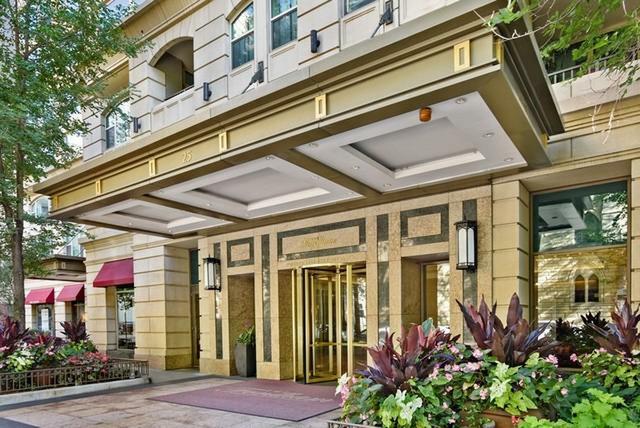 Located on a peaceful tree-lined street steps from Chicago's Magnificent Mile, The Fordham combines vintage elegance with a variety of modern amenities. The 50-story building is comprised of one- to three-bedroom condominiums, 11th-floor townhomes and exclusive penthouses. Luxury amenities include a wine cellar and tasting room, a humidor room and lounge, screening room, spa, exercise room and year-round pool, maid and room service, and a rooftop recreation area. Each home at 25 East Superior features high ceilings, large windows with spectacular city views, private terraces, gas fireplaces and luxury wood and marble finishes. 25 E Superior allows both dogs and cats and deeded parking is available in the attached garage.